Do you love to play music keyboard ? If you love playing virtual music keyboards on your iPhone or iPad, this article can help you to find the best Piano apps for your iPad & iPhone. These apps would be very useful for iOS users who love playing virtual musical instruments. In this article, you can see some very useful and amazing Piano apps for your iPhone/iPad. Check the list of top apps. 1. 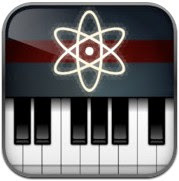 Grain Science ( iPhone & iPad ) – Grain Science is a fully functional virtual piano app for iPhone and iPad that lets you enjoy playing music keyboard your device. The app is mainly designed for musicians, soundscape artists and SFX engineers who love using fully functional piano app. Grain Science lets you use built-in waveform, or record or import your own to create high quality music on your device. Featured rich app that comes with two grain units per voice which allow you to combine for morphing or complex modulated sounds, then send through a configurable FX chain. Beautifully designed app that has many features including different types of distortion, high and low pass filters, chorus, flanger, phaser, resonance and echo, Virtual MIDI, background audio and customizable performance screen. 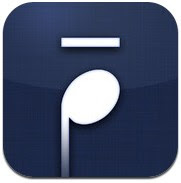 An excellent app for musicians and music lovers. 2. Tenuto ( iPhone & iPad ) – Beautiful and full featured piano app for iPhone and iPad that comes with a great collection of 15 customizable exercises designed to enhance music quality. The app includes tons of features such as five musical calculators, different types of useful exercises ( Staff based , Keyboard based , Fretboard based & Ear Training Exercises ) and many other features. Great app that comes with an easy to use interface and five very useful musical calculators for accidentals, intervals, analysis symbols, chords and twelve tone matrices. 3. 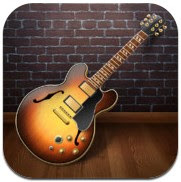 GarageBand ( iPhone & iPad ) – One of the most popular virtual musical instrument app that lets you enjoy playing different types of music instruments on your device such as pianos, guitars, organs, drums, and basses. The app comes with high quality sound that can help you play music like professionals. Great app that can turn your iPad or iPhone into a complete recording studio. With GarageBand, you can play dozens of your favorite musical instruments using multi touch music keyboard, record your voice with fun sound effects to create song like pro, share your songs directly to social networks such as Facebook, YouTube or Soundcloud. Great app that has many musical instruments and tools. 4. Virtuoso Piano Free 3 ( iPhone & iPad ) – One of the best virtual analog synthesizers for iPhone users and it comes with lots of features which let you enjoy playing music like pro. The app includes many features such as – two different types of filters per voice with configurable routing , morphing music with effects, virtual Midi ports , background audio , Oscillators , lots of sound effects, 88 keys sampled painos, built-in recorder, playback modes, customizable piano keyboard size and many other tools and features. Featured rich piano app for iPhone that lets you play high quality music on your device. 5. 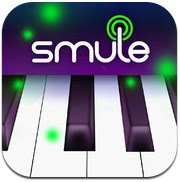 Magic Piano by Smule ( iPhone & iPad ) – If you are looking for free piano app for iPhone or iPad, you can try Magic Piano that comes with tons of features with a nice user interface. The app lets you play high quality sounds and access tons of free songs. The app includes hundreds of free songs such as pop, classical, rock, movies, musical etc. Very useful app that comes with more than 600 songs. 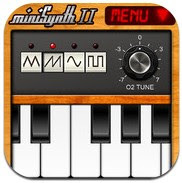 6. miniSynth 2 ( iPhone ) – Very powerful iPhone Piano app that is integrated with tons of features. The app lets you play music like pro and enjoy high quality sounds on your device. The app includes 32-bit professional quality DSP, sound effects, filters, audio background, audio copy/paste function, 30 factory presets and many other features. Very useful and powerful virtual piano app for iPhone.